The following are the most recent fatal or significant airliner events that either occurred in US territory, involved a US carrier, or involved any air carrier flying to or from the US. In each numbered event, the airliner had the capacity to carry 10 or more passengers, and at least one airline passenger was killed. 23 February 2019; Amazon Prime Air 767-300; N1217A; flight 3591; near Anahuac, TX: The aircraft was on a cargo flight from Miami, FL to Houston, TX and crashed into Trinity Bay about 30 miles (48 km) southeast of its destination. The two crew members and one passenger were killed. 10 August 2018; Horizon Air Dash 8-402Q; N449QX; near Seattle, WA The aircraft was taken on an unauthorized flight by Richard Russell, a ground service operator with the airline who not certified as a pilot, and did not have authorization to be in the aircraft. After departing from Seatac Airport, Russell flew the aircraft for about 75 minutes in an area south of Seattle, performing number of extreme maneuvers, before crashing on an island in Puget Sound about 40 kilometers south of the departure airport. Russell, the sole occupant of the aircraft, was killed. 17 April 2018; Southwest Airlines 737-700; N772SW; flight 1380; near Philadelphia, PA: The aircraft was on a scheduled flight from New York, NY to Dallas, TX. Shortly before reaching cruising altitude, the left engine experienced a catastrophic failure, with engine debris striking the side of the aircraft. One passenger window was breached by engine debris and the aircraft had a rapid decompression. The flight crew executed an emergency descent and diverted to Philadelphia. All five crew members survived and one of the 143 passengers was killed. 7 November 2017; ICON A5; N922BA, Clearwater, FL: Former Toronto Blue Jays and Philadelphia Phillies pitcher Roy 'Doc' Halladay was killed when his amphibious, light sport aircraft crashed into the water at a steep angle. According the NTSB, earlier in his flight, the aircraft was flying at a low altitude over water, and passed as close as 75 feet from several beach houses. Video footage taken of the airplane before the accident, shows the airplane in a descending left 45 degree banked turn and then maneuvering about 10 ft above the water. A witness to the accident stated, during an interview with an NTSB investigator, that he saw the airplane perform a climb to between 300 and 500 ft on a southerly heading and then turn and descend on an easterly heading about a 45 degree nose-down attitude. The aircraft broke up and sank after hitting the water. Halladay was the sole occupant of the aircraft. 8 September 2017; Schweizer 269C helicopter; N204HF; Medford, NJ: Singer Troy Gentry, of the music duo Montgomery Gentry, was killed in the crash of a Schweizer 269C during flight at the Flying W Airport in Medford, NJ. Gentry, who was scheduled to perform at a concert at the airport later that day, was on an orientation flight conducted by a commercial helicopter pilot. During the flight, the pilot experienced throttle control issues and executed an autorotation maneuver to land the helicopter. The helicopter struck the ground a high descent rate, killing both Gentry and the pilot were killed by the impact. They were the only occupants of the helicopter. 7 July 2017; Air Canada; Airbus A320-200; C-FKCK; flight 759; San Francisco, CA: The aircraft was on a scheduled international flight from Toronto, Canada and San Francisco, CA. 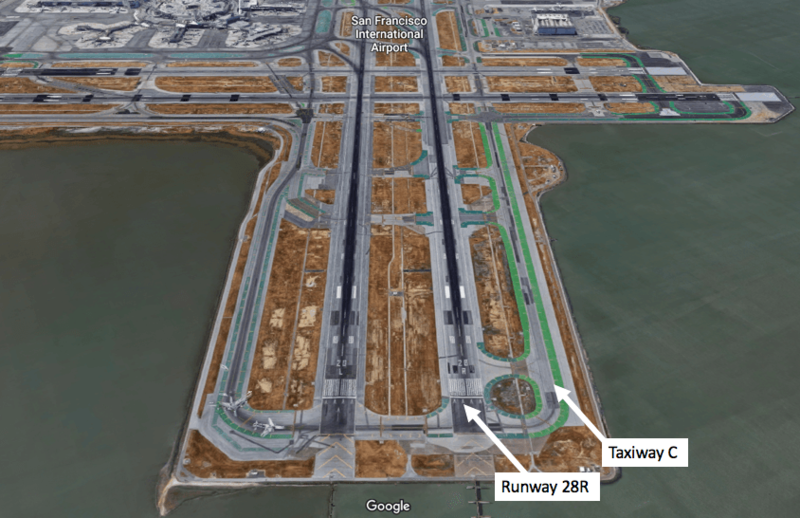 Shortly before midnight, the aircraft was on a visual approach to Runway 28R, but was apparently aligned with the Taxiway C, which parallels Runway 28R. The aircraft continued toward the taxiway and had overflown that taxiway by about 0.25 miles (400 meters) when ATC instructed the aircraft to go around. There were four aircraft lined up on Taxiway C at the time. The landing aircraft passed about 100 feet (30 meters) above the first two aircraft, 200 feet (61 meters) above the third aircraft, and 300 feet (91 meters) above the fourth aircraft. The closest lateral proximity between the landing aircraft and one of the four aircraft on taxiway C was 29 feet (nine meters). 28 October 2016; American Airlines 767-300; N345AN; flight AAL383; Chicago, IL: The aircraft was on a scheduled domestic flight from Chicago, IL to Miami, FL. During the takeoff, the right engine experienced an uncontained failure, and the flight crew aborted the takeoff. The aircraft caught fire in the area of the right engine, and the aircaft occupants evacuated the aircraft. There were eight minor injuries among the 161 passengers and nine crew members. 27 October 2016; Eastern Airlines 737-700; N278EA; New York, NY: The aircraft was on an unscheduled domestic charter flight from Fort Dodge, IA to LaGuardia Airport in New York. After landing, the crew was unable to come to a stop on the runway. The aircraft was slowed by an arrestor bed of low-density concrete that was in place beyond the end of the runway. None of the 40 passengers or crew were injured. Among the passengers was Vice Presidential candiate Mike Pence, who is also the governor of the US state of Indiana. 30 July 2016; Kubicek BB85; SU-GCC; near Lockhart, TX: The ballon was on an unscheduled flight that departed from Fentress Airpart in Fentress, TX. The ballon crashed burned after striking power lines about eight miles (12.9 km) from the launch location near Lockhart, TX. The pilot and all 15 passengers were killed. at an airport near Fentress, TX. While the victims and the ballon's gondola (an open basket) were near the point where the ballon struck power lines, the envelope was located roughly three-quarters of a mile (1.2 km) away. According to the NTSB accident and incident database, there were 73 previous fatal balloon-related events in the US or involving a US-registered ballon outside the US. These prior events involved at most six fatalities. 15 December 2015; Southwest Airlines 737-300; N649SW; flight 31; Nashville, TN: The aircraft was on a scheduled domestic flight from Houston, TX to Nashville, TN After arrival, the aircraft slid off the taxiway, collapsing its nose landing gear and coming to rest in a ditch. None of the five crew members or 133 passengers were killed. Several passengers sustained minor injuries. 4 November 2015; Rais Group International BAe 125-700; N237WR; flight EFT1526; Akron, OH: The executive jet was on a nonscheduled domestic passegner flight from Dayton, OH, to Akron, OH, and crashed about two miles (3.2 km) short of the landing runway. Shortly before the crash, the jet was seen to be banking to the left before hitting power lines and crashing into a pair of residential structures. Both pilots and all seven passengers were killed. No one on the ground was injured. 5 March 2015; Ryan ST3KR Recruit; N53178; Santa Monica, CA: Ford was the pilot and sole occupant of a Ryan ST3KR Recruit, a two-seat, open cockpit aircraft that was used extensively as a training aircraft by the US military in WWII. According to a preliminary report from the NTSB, Ford reported a loss of engine power shortly after taking off from the Santa Monica airport, and was attempting to return to runway 3 at Santa Monica. 31 October 2014; Scaled Composites; Model 339 (SpaceShipTwo); N339SS; near Cantil, CA: The vehicle, which is designed to fly into the lower reaches of space (above 100 km above Earth) was on its first powered test flight with a new engine fuel and oxidizer combination (nylon and nitrous oxide). SpaceShipTwo was dropped from its carrier vehicle at about 45,000 feet, and ignited its engine. Roughly two minutes after release, the vehicle experienced an inflight breakup. One of the two crew members was killed, and the other was able to bail out of the vehicle and was injured. Prior to the accident flight, there had been the 54 test flights of SpaceShipTwo, of which 34 involved a release from the carrier aircraft, including three powered flights. Scaled Composites, which conducted the flight test, is a partner of Virgin Galactic, which had planned on using SpaceShipTwo to take passengers on suborbital trips into space in the near future. 7 October 2014; California Dept of Forestry and Fire Protection; Marsh S-2F3AT Turbo Tracker; N449DF; near Foresta, CA: The fire-fighting aircraft, which was based at Hollister Air Attack Base, CA impacted a forested hillside during a fire suppression operation near the Yosemite National Forest, California. The pilot, and sole crew member, was killed. 7 July 2013; Rediske AirDHC-3 Otter; N93PC; Soldatna, AK: The aircraft was on a nonscheduled domestic flight from Soldatna, Alaska to Bear Mountain Lodge, aslo in Alaska. The aircraft crashed during takeoff, killing the pilot and all nine passengers. 6 July 2013; Asiana Airlines 777-200ER; HL7742; flight 214; San Francisco, CA: The aircraft was on a scheduled international flight from Seoul, South Korea to San Francisco, and the rear of the aircraft struck a seawall just short of the runway while landing. The tail section broke apart, and both horizontal stabilizers and the vertical fin separated from the aircraft. Both engines and the main landing gear also separated from the aircraft. The aircraft caught fire after it came to rest, but not before all of the crew and most of the passengers were able to escape. All 16 crew members survived, but thee of the 291 passengers, all teenage girls from China, were killed. Visit the Asiana Airlines page for detailed background information on this event. 29 April 2013; National Airlines 747-400; N949CA; Bagram Air Base, Afghanistan: The aircraft had just departed on a cargo flight to Dubai, UAE when the aircraft entered a stall and crashed near the end of the runway. At one point, the aircraft had rolled to the right in excess of 45 degrees. Although the crew was able to put the wings more or less level, the aircraft impacted the ground at a high vertical speed, causing an explosion and fire. All seven crew members were killed. 1 April 2011; Southwest Airlines 737-300; N632SW; flight 812; near Yuma, AZ: The airliner, with 118 passengers and a crew, was on a scheduled flight from Phoenix, AZ to Sacramento, CA, when it experienced a rapid loss of cabin pressure after a rupture developed in the upper fuselage about 18 minutes after takeoff when the aircraft was climbing through 34,000 feet. After the loss of cabin pressure, the crew was able to divert to Yuma, AZ without further incident. There were no serious injuries among the 118 passengers and crew members on board. The rupture was about five feet long and about a foot wide. Because no passengers were killed, this event was not counted as a fatal event as defined by AirSafe.com. 9 August 2010; de Havilland DHC-3T Otter; near Dillingham, AK: Former Alaska Senator Ted Stevens was one of five people killed when an turbine engine, float equipped Otter crashed into steep terrain during a flight from nearby Lake Nerka to a fishing lodge in the Dillingham, Alaska area. The pilot and four passengers, including Stevens, were killed, and four other passengers were injured. One of the survivors was former NASA administrator Sean O'Keefe. Coincidentally, the pilot who was killed in this crash was the father-in-law of one of the pilots killed in a USAF C-17 crash the previous month near Anchorage, AK. 28 July 2010; US Air Force; C-17; near Anchorage, AK: The aircraft had taken off from Elemendorf AFB near Anchorage, Alaska and crashed during a local training mission. The aircraft came down in a wooded area about two miles from the runway. All four on board were killed. The aircraft and crew were based at Elmendorf. This was the first fatal crash involving the USAF C-17, also known as the Globemaster III. In two previous incidents, a C-17 sustained engine damage after being struck by a surface to air missile in Iraq in 2003, and in 2009 a C-17 had a gear up landing in Afghanistan. 25 December 2009; Northwest Airlines A330-300 (N820NW); Flight 253; near Detroit, MI: A passenger on a Northwest Airlines A330-300(N820NW) apparently attempted to detonate an explosive device while the aircraft was approaching Detroit. Flight 253 was an international flight from Amsterdam to Detroit, and early reports are that a passenger, Umar Farouk Abdulmutallab, a 23-year-old Nigerian national, allegedly had the device strapped to one of his legs, and that the device was triggered during descent (about 20 minutes before landing) and started a small fire. The flight, operated by Northwest Airlines using an Airbus 330-300 aircraft with 278 passengers and 11 crew members on board, landed safely, and the suspect, the only person injured, was transported to a local hospital for treatment of serious burns. 22 December 2009; American Airlines 737-800 (N977AN); Flight 331; Kingston, Jamaica:The aircraft was on a scheduled international flight from Miami, FL to Kingston, Jamaica. The aircraft landed during a rainstorm, and was unable to stop on the runway. After departing the runway, the aircraft went beyond the airport fence, and crossed a road before coming to rest on a beach. The landing gear collapsed, both engines separated from the wings, and there were two major breaks in the fuselage, but all 148 passengers and six crew members survived. The landing was carried out with a slight tail wind. 8 August 2009; Eurocopter and Piper Saratoga, Hudson River, near New York City:A single-engine aircraft and a sightseeing helicopter collided early Saturday afternoon over the Hudson River near Manhattan. Three people were aboard the single-engine Piper PA-32R-300 (N71MC), and the flight plan indicated the aircraft was heading from Teterboro Airport in Teaneck, New Jersey to Ocean City, New Jersey. The Saratoga took off from Teterboro shortly before noon local time. On board were a pilot and two passengers, including one child. The Liberty Harbor Sightseeing Tours helicopter, a Eurocopter AS350 (N401LH), took off from Pier 30 in Manhattan, near West 30th Street, and reportedly had one pilot and five Italian tourists on board. All nine occupants were killed. Visit the AirSafe.com News for more information. 23 March 2009; FedEx Express (FedEx) MD-11F; near Tokyo, Japan: The aircraft was on a cargo flight from Guangzhou, China to Narita Airport near Tokyo, Japan. The aircraft bounced on landing, and contacted the runway a second time nose wheel first before rolling to the left, contacting the runway with its left stabilizer and wing, and catching fire. The aircraft ended up in an inverted position. Both crew members were killed. (Note: Event dates are determined by the date at the location of the event). 22 March 2009; Pilatus PC-12; Butte, Montana: The aircraft was on an unscheduled flight from Orville, CA to Bozeman, MT. The pilot changed the flight plane to Butte, MT, and the aircraft crashed about 500 feet (150 meters) from the airport. All 14 on board were killed, several of them children. According to the NTSB, there have been at least six previous fatal accidents in the US involving the Pilatus PC-12. 12 February 2009; Continental Connection (Colgan Air) Dash 8 Q-400; near Buffalo, NY: The aircraft, a scheduled flight from Newark, NJ and operated by Colgan Air, crashed in a residential area about five miles from the airport. At least one house on the ground was destroyed. All 44 passengers and four crew members were killed, along with one person on the ground. 20 December 2008; Continental Airlines 737-500; Denver, CO: The aircraft, which was on a scheduled flight to Houston's Intercontinental Airport, departed the runway during takeoff and skidded across a taxiway and a service road before coming to rest in a ravine several hundred yards from the runway. The aircraft sustained significant damage, including a post crash fire, separation of one engine and separated and collapsed landing gear. There were about 38 injuries among the 110 passengers and five crew members, including two passengers who were seriously injured. Because this did not involve the death of an airline passenger, this is a significant event as defined by AirSafe.com. 8 December 2008; USMC F/A-18D; Near San Diego, CA: A US Marine Corps F/A-18D jet based at the Miramar Marine Corps Air Station crashed during approach about two miles short of the runway. The pilot successfully ejected, but four people, two children, their mother, and grandmother were killed in one of the two houses destroyed by the jet. No one else on the ground was injured. More details about this crash. 19 September 2008; Global Exec Aviation Learjet 60; Columbia, SC: Travis Barker, former drummer for the music group Blink-182, Adam Goldstein, more widely known as DJ AM, and two other passengers were in a Learjet 60 aircraft that was on a chartered flight from Columbia, South Carolina to Van Nuys airport in Los Angeles. The crash, which happened shortly before midnight, occurred during takeoff. The crew was unable to stop the aircraft before it departed the runway. The plane struck a series of antennas and lights, crashed through a fence, crossed a nearby highway, and came to rest on an embankment where it burst into flames. The crash and subsequent fire killed both flight crew members and two of the four passengers. 12 January 2008; Senator Barack Obama; Gulfstream 2; Chicago, IL: United States Senator and presidential candidate Barack Obama was a passenger in a Gulfstream 2 aircraft that collided with another aircraft on the ground at Midway Airport in Chicago. Senator Obama, members of his campaign staff, and Secret Service agents had just flown in from Nevada, where he had been campaigning. The left wingtip of the Gulfstream hit the right wingtip if a parked and unoccupied Cessna 208 aircraft. The impact was so minor that no one on the plane noticed any damage until later. 11 October 2006; Cirrus SR-20; New York, NY: New York Yankees pitcher Cory Lidle and his flight instructor Tyler Stanger were killed when their aircraft crashed into a 50-story building on the upper east side of Manhattan. There were no fatalities on the ground. Because this event did not cause a passenger fatality on an airliner, it is not counted as a fatal event as defined by AirSafe.com. This event is being treated as a major accident investigation by the NTSB, which is unusual for events involving a single private aircraft. It is likely that this treatment is due to the ongoing security concerns surrounding aircraft crashes into buildings in large U.S. cities. 19 December 2005; Chalk's Ocean Airways Grumman G-73T Mallard; Miami, FL: The aircraft was on a scheduled international flight from Miami to the island of Bimini in the Bahamas. Shortly after takeoff, the aircraft experienced an apparent structural failure that resulted in the right wing separating from the aircraft. The aircraft crashed into Biscayne Bay just off Miami Beach. Both crew members and all 18 passengers, including three infants,were killed. 8 December 2005; Southwest Airlines 737-700; Chicago, IL: The aircraft was on a scheduled flight from Baltimore to Chicago's Midway Airport. After landing, the crew was unable to stop the aircraft on the runway, going off the runway, through the airport's barrier fence and onto a nearby street. At some point during this event, the nose wheel collapsed. The aircraft struck at least two vehicles, with the impact causing fatal injuries to a six year old boy who was a passenger in one of the vehicles. None of the five crew members or 95 passengers were seriously injured. This was the first serious accident involving the 737-700. 7 December 2005; American Airlines 757; Miami, Fl: The aircraft had arrived from Medellin, Colombia, and was on a roughly two hour stopover in Miami before continuing to Orlando. It is alleged that one of the passengers, a 44-year old U.S. citizen, claimed to have a bomb in his carry on luggage. Air marshals confronted the man on the jetway and shot him after he appeared to reach into his bag. The man died sometime later as a result of his wounds. No explosive was found in the bag. It was reported that this passenger had previously arrived in Miami on an American flight from Quito, Ecuador and had cleared U.S. customs before boarding the Orlando flight. No one else was injured in this event. This is the first time sine 9/11 that air marshals have fired a weapon on or near an aircraft. This event was not considered an accident by either the FAA or NTSB and is in fact an airliner landing on a malfunctioning landing gear occurs several times a year around the world. One reason for the interest was the fact that many of the passengers were able to view live images of their aircraft until shortly before landing. 18 March 2005; American Airlines 767; en route from Los Angeles to New York JFK: The aircraft was on a scheduled flight from Los Angeles to JFK airport in New York when a passenger allegedly assaulted a flight attendant. The 48 year old passenger was then restrained by the cabin crew using flexible handcuffs. Reportedly, seven passengers also helped to restrain the passenger during the latter stages of the flight. At some point, the passenger had difficulty breathing. After landing at JFK, the unconscious passenger was then taken to a local hospital where he was pronounced dead. The New York City medical examiner's office later ruled the death an accident that was caused acute cocaine and alcohol intoxication, which was aggravated by heart trouble. No other crew members or passengers were seriously injured or killed. Because this passenger death was due at least in part to the deliberate actions of that passenger, this does not constitute a fatal event as defined by AirSafe.com. 19 October 2004; AmericanConnection (Corporate Airlines) BAe Jetstream 32; near Kirksville, MO: The aircraft was on a scheduled flight from St. Louis to Kirksville when it crashed about four miles (6.4 km) south of the destination airport. According to the National Weather Service, visibility was about four miles at the time of the crash, with low clouds created a 300-foot ceiling. Both crew members and 11 of the 13 passengers were killed. The aircraft crashed into a maintenance hanger at the airport shortly after it departed for a flight to Greenville, SC. Both pilots and all 19 passengers were killed in the crash. The aircraft was operated for US Airways Express by Air Midwest. 18 July 2002; U.S. Forest Service Consolidated-Vultee P4Y; near Estes Park, CO: The aircraft, which was maneuvering to deliver fire retardant on the Big Elk wildfire northwest of Lyons, Colorado, lost control and crashed after the left wing separated in flight. The airplane had flown seven previous air attack missions on the fire that day. Prior to the accident mission, the airplane was loaded with approximately 2,000 gallons of fire retardant, and 550 gallons of fuel. The wings of the aircraft separated from the fuselage near the wing roots just as the crew was finishing dumping its load of fire retardant. According to a pilot in a following aircraft, there was a fire near the fuselage as the wing failed inboard of the number two engine. At the time of the accident, there was no turbulence in the area and Both flight crew members were killed in the crash. 17 June 2002; U.S. Forest Service C130A; near Walker, CA: The aircraft, which was being used in a fire-fighting role, broke apart in flight while executing a fire retardant delivery near Walker, California. The wings of the aircraft separated from the fuselage near the wing roots just as the crew was finishing dumping its load of fire retardant. A fire ignited in the area of the separated wings as the fuselage plunged into the ground. The three flight crew members were fatally injured and the airplane was destroyed. This aircraft, which had been originally manufactured in 1957, is a former U.S. Air Force aircraft that entered civilian service in 1988. The aircraft over 20,000 flight hours. 12 November 2001; American Airlines A300; Queens, New York: The aircraft was on a flight from New York to Santo Domingo, Dominican Republic when it crashed into a residential neighborhood just outside JFK airport. The aircraft experienced an in-flight breakup, with the vertical fin and one engine landing away from the main impact site. The crash damaged or destroyed several homes, and killed five people on the ground. All nine crew members and 251 passengers, including five infants, on the aircraft were killed. 11 September 2001; American Airlines 767 (Flight 11); World Trade Center, New York: The aircraft was on a flight from Boston to Los Angeles when it was hijacked and flown into one of the World Trade Center Towers. Another jet, a United Airlines 767, was hijacked and crashed into the other tower. Both towers later collapsed. All 11 crew members, 76 passengers, and five hijackers were killed, as were untold numbers of people on the ground. 11 September 2001; United Airlines 767 (Flight 175); World Trade Center, New York: The aircraft was on a flight from Boston to Los Angeles when it was hijacked and flown into one of the World Trade Center Towers. Another jet, an American Airlines 767, was hijacked and crashed into the other tower. Both towers later collapsed. All nine crew members, 51 passengers, and five hijackers were killed, as were untold numbers of people on the ground. 11 September 2001; American Airlines 757 (Flight 77); The Pentagon, Arlington, VA: The aircraft was on a flight from Dulles to Los Angeles when it was hijacked and flown into the Pentagon, collapsing part of the structure. All six crew members, 53 passengers, and five hijackers were killed. 11 September 2001; United Airlines 757 (Flight 93); near Pittsburgh, PA: The aircraft was on a flight from Newark to San Francisco when it was hijacked. However, the aircraft crashed outside Pittsburgh. All seven crew members, 34 passengers, and four hijackers were killed. 29 March 2001; Airborne Charter Gulfstream III; Aspen CO: The private jet was approaching Aspen's Sardy Field after a flight from Los Angeles, CA when it crashed near the airport. There was light snow and fog in the area at the time of the crash and the aircraft was executing an instrument approach at about 7 p.m local time. All three crew members and 15 passengers were killed. Airborne Charter is owned by Cinergi Pictures Entertainment. Cinergi credits include films such as "Die Hard with a Vengence," "Tombstone," "Evita" and "Nixon." 27 January 2001; Beechcraft King Air; near Denver, CO: Two Oklahoma State basketball players, an OSU basketball executive and five staffers and broadcasters associated with the program were killed when their plane crashed shortly after takeoff from the Jefferson County airport near Denver, CO. The two crew members were also killed. The charted aircraft was bound for Stillwater, Oklahoma when it took off during snowy conditions. The aircraft crashed and burned shortly after takeoff Tuesday night in Taipei on a scheduled flight bound for Los Angeles. The aircraft reportedly attempted to take off on a runway that was undergoing repairs and struck construction equipment on the runway. There was rain and wind in the area from an approaching typhoon at the time of the crash. There were 78 fatalities among the 159 passengers and four fatalities among the 20 crew members on the aircraft. 16 October 2000; Cessna 335; near St. Louis, MO: The governor of Missouri, Mel Carnahan, along with two others were apparently killed in the crash of a small private plane about 25 miles (40 km) south of St. Louis. The aircraft had departed from the St. Louis area about 7 p.m. local time and was transporting the governor to a campaign stop in New Madrid, Missouri. The accident occurred at about 7:30 p.m., shortly after the pilot had reported a problem with one of the aircraft's instruments. The accident occurred at night and there was rain and fog in the area. 11 August 2000; Southwest Airlines 737; en route from Las Vegas, NV to Salt Lake City, UT: The aircraft was on a scheduled flight from Las Vegas to Salt Lake City when about 20 minutes before landing, a 19 year old passenger became belligerent and attempted to enter the cockpit. While being escorted back to his seat, the 19 year old attacked another passenger. A number of other passengers subdued him until the aircraft landed. After landing, the now unconscious passenger was removed from the aircraft and he died several hours later. The medical examiner found traces of drugs in the dead passenger's system, but listed the cause of death as suffocation. The death was classified as a homicide, but none of the passengers involved in the incident were charged with a crime. No other crew members or passengers were seriously injured or killed. Because this passenger death was due at least in part to the deliberate actions of that passenger, this does not constitute a fatal event as defined by AirSafe.com. 25 July 2000; Air France Concorde near Paris, France: The aircraft was on a charter flight from Charles de Gaulle airport near Paris to JFK airport in New York. There was apparently a problem with at least one of the engines, either during takeoff or shortly after takeoff. The aircraft caught fire and crashed into a hotel near the airport. All 100 passengers and nine crew members were killed. Four people on the ground were also killed.